Mayo Clinic was honored this year to be included in Fortune magazine’s Leadership Series. 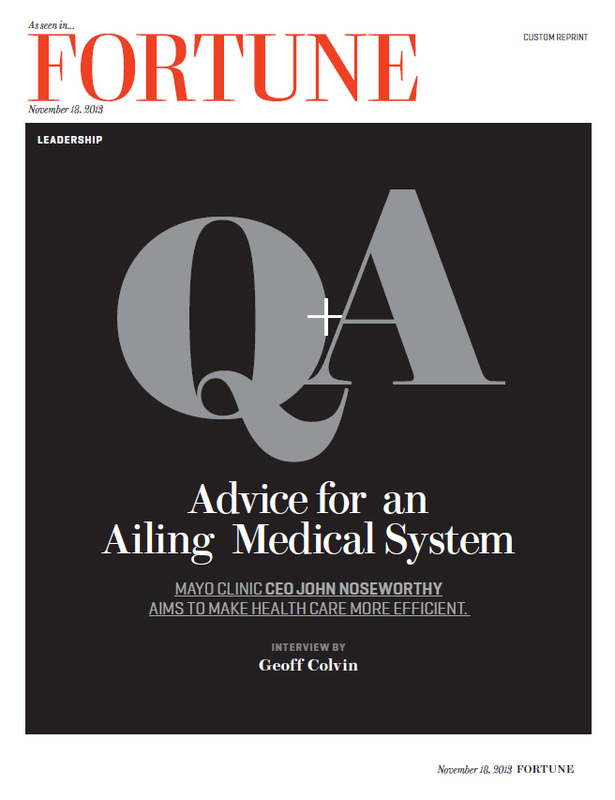 In this article senior editor-at-large Geoff Colvin asked insightful questions about our institution and we talked about the concerns and opportunities we have in health care today. Geoff wrote: “When you run the world’s largest private medical practice, you don’t just respond to sweeping changes in health care — you can also influence them.” I appreciate his observations because Mayo Clinic has always felt a responsibility to help figure out the best ways to care for and treat patients, and then share that knowledge with others. We spoke about the main topic in health care today — the implementation of the Affordable Care Act. At this point, the ACA is about insurance reform; at Mayo, we’re looking down the road and focusing on the future of health care. We have concerns about the fragmentation and quality of care in this country, and we want to be part of the change that is needed in those areas. Ultimately, we want to have a system that offers quality, affordability and sustainability. Editor's note: John Noseworthy, M.D., is the president and CEO of Mayo Clinic.